Click Each Image to Go to the Product Page for Details, Prices and to Personalize Softball Gifts. If you don’t see your color, I can change most parts of my designs to most any color. Unique softball gifts for players, gifts for softball fans and softball lovers. Personalize with your name or school name, or other text! Our clocks are unique and classy! Cool and Cute Softball Fleece Blanket with coordinating and matching softball throw pillows too. Different choices include even our unique Turquoise Glass! When you see a solid background color, that means you can change it to whatever color you wish. I usually write Instructions in the lower written area of the “Design Description” or CALL Linda, and I will customize it for you. Linda: 239-949-9090. Custom Softball Throw Blankets will be the perfect companion for the other softball room decor. You can even CHANGE the Background and Text COLORS on many of the cute softball bedroom decor. 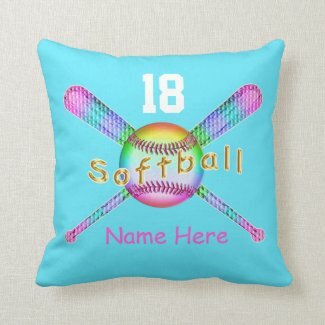 Cozy comfortable cute softball room decor personalized just for her! Decorate your room or dorm room with our Girls softball themed pillows and blankets! To find more options, including bolster pillows, visit Girls Softball Pillows and Blankets to find many different styles and designs! 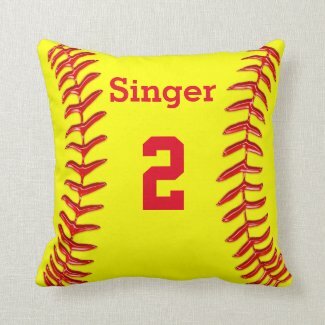 Personalize Your Softball Themed Bedroom! Personalize with your stats and/or Celebrate your team win! Great for party decorations, too! 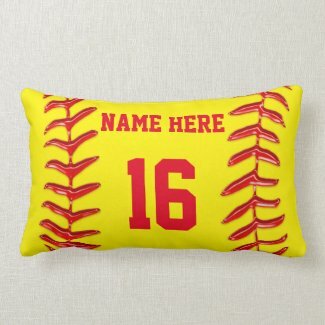 Decorate with your love of Softball in your bedroom or dorm room ~ your text or your Name, Number, Team or School Name! Unique Personalize Girls Softball Themed Decorations! Get a general view of many other personalized softball gifts for teams, softball party souvenirs and softball gift ideas for girls. Any part of my softball designs can be placed in any color on hundreds of Zazzle products. How Does a Coach Affect Your Life? How has your coach influenced your life on and off the field? Maxprep’s answers this question with a video of players of different sports. “Plays a critical role in development,” “compassionate,” “class act,” “respecting the game, respecting their teammates, and respecting others,” “gave me opportunities, gave others opportunities,” “very positive, very supportive,” “helped each kid to reach their potential,” “biggest role model in my life besides my parents,” are just some of the reasons Coaches are an integral part of athletes, sports, and creating responsible citizens. Where would we be without the compassion and support, the “tough love” of coaches?! Pick up a bat?! Slide into home? After school or on the weekends! And winning in an even bigger way than you would have even thought. Of course, if you exercise you improve your overall feeling of well being…chasing the blues away naturally, giving yourself a real boost! And besides pumping endorphins even after the game is over, you will be swinging a brighter step on the field and off. And there’s so much more! When you take up a team sport, sharpening your athleticism and skills also sharpens your studying skills and making the grade will fall into place just as you do up to bat! You give it your all! Making a hit, running bases, scores a home run for years to come. Think about it: A winning attitude, cooperation, team work, listening to Coach, cooperating, practicing and practicing are all great marks of a winner in the “real” world off the field as well as on the field! Those who work to win, win at work, long after the bleachers have cleared and everyone has gone home and the championship is celebrated. Yes, taking your attitude to the next level and stretching your muscles and your brain will win you more than just the games. Being a winner in life starts with that first step you take, proving you want to win. Visit Rivals.com for more info on the Benefits of Playing Softball. Looking for Even More Fun Decorating and Gift Ideas? We have a huge selection of Sports themed Gift Ideas! Customize and/or Personalize many unique treasures! Create memories that will last a lifetime! Visit our Zazzle store and see how easy it is to create your treasure! You can’t beat Zazzle store for bulk pricing or no minimum order ~ that’s right, no order is too small! Their state of the art printing can’t be beat, and their 100% customer satisfaction, backed by the Better Business Bureau assures you of a great relationship for years to come! We certainly take pride in what we do, and we will personally assist you in customizing your order to your complete 100% satisfaction! We really appreciate and want to Thank you for taking the time to read our softball room decor page. I am a Zazzle Designer for which I will receive a small commission when you purchase any of my products with Little Linda Pinda Designs. Please call 239-949-9090 and ask for Bev to help you customize your order at no extra charge!